Spelling Bee competition, 31 students were whittled down to two. Hollingworth Elementary School is teaching students it’s never too soon to start thinking about college. Unified students’ spirit of their adopted schools. 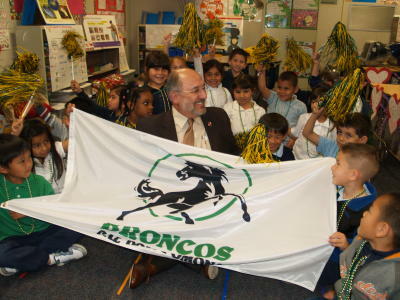 Every classroom had a flag to hang, except Cynthia Alvarez’s kindergarten class. Find out what college the kids adopted in Jessica Donnelly’s story at COLLEGE. AS promised, state Sen. Bob Huff is back with legislation to give epileptic children access to emergency medication at school. administer fast-acting medication to a student having a seizure. those who suffer a seizure outside a hospital or doctor’s office. It was a big day at Chaparral Middle School, when they opened the big new gym. The Diamond Bar campus dedicated the grand facility this month. The $3.6 million project included $1 million for modernizing the school’s infrastructure. That work preps the site for a new science complex, performing arts wing and food service facility. But right now, Walnut Valley Unified was celebrating the new 86,000-square-foot sports facility. And they have a lot to celebrate. Read more about the wonderful new gym in Richard Irwin’s story at GYM. from a kit of parts.